Galaxy Tab 8.9 launching October 2nd in the U.S. 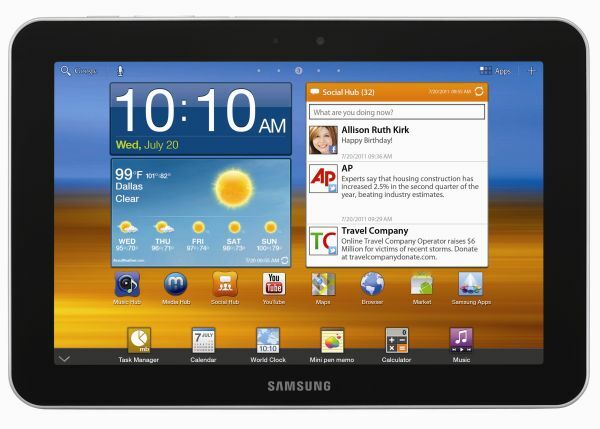 The 8.9-inch Samsung Galaxy Tab will hit store shelves this Sunday, October 2nd, according to InformationWeek. Best Buy has been offering the device for pre-order for the last couple of weeks. A 3G-equipped model of the Galaxy Tab 8.9 for the U.S., however, is still up in the air. Users wishing for wireless broadband out of their Samsung tablet may want to check out the Galaxy Tab 10.1 with LTE for Verizon or T-Mobile instead. The smaller Galaxy Tab 7.7 may be coming to the states as well, but the latest model at the FCC is apparently lacking WWAN radios. As expected, the Galaxy Tab 8.9 will use an Nvidia Tegra 2 processor with 1GB RAM and a 16GB SSD. Beyond its size, the 8.9-inch model is not much different from the 10.1-inch Galaxy Tab. The unit overall will weigh about 447 grams (0.98 pounds) and cost $469, which is notably cheaper than the 16GB iPad 2 by $30. A 32GB model will be available as well for $569. 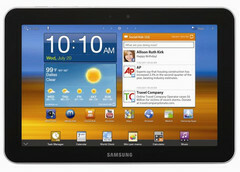 > Notebook / Laptop Reviews and News > News > News Archive > Newsarchive 2011 09 > Galaxy Tab 8.9 launching October 2nd in the U.S.